Can I use my app to control how much food my dog eats? Have a food-loving pup who just can't get enough of the Hub? There's a few ways to make sure they're not overeating. One way is to just put your dog’s daily amount of food in the Hub each morning. If you'd prefer, you can also use your app to define the maximum number of times your dog can eat from the Hub each day. 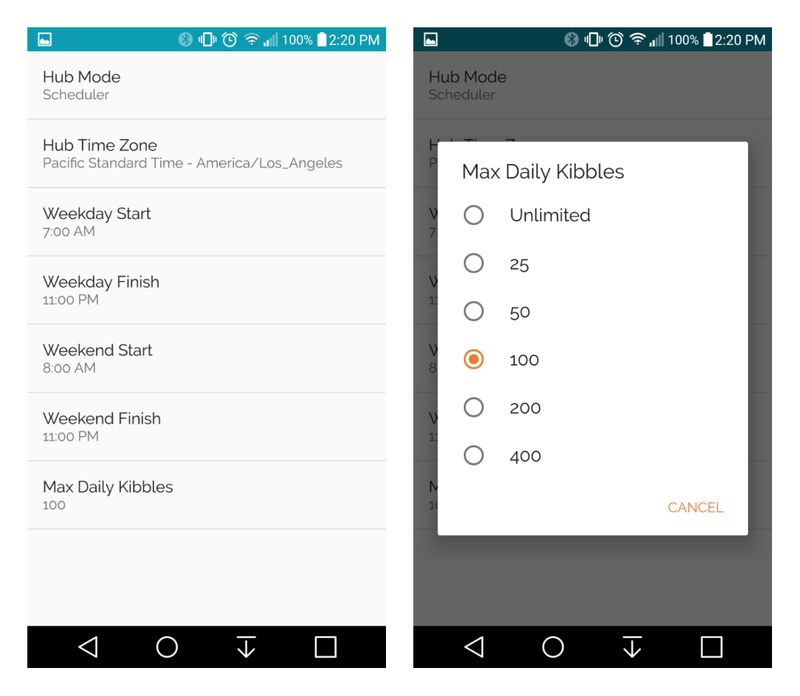 You can find this option in your app's settings menu, under "Max Daily Kibbles", as shown in the screenshot below. To use this feature, your Hub's mode will need to be set to "Scheduled". If the mode is set to "Stay On", the Hub will keep offering puzzles until it runs out of food. In this example, the user has chosen a limit of 100 kibbles. This means his pup can eat from the dish 100 times before the Hub stops offering puzzles for the day. When this happens, the light on the front of your Hub will turn orange. How do I know how many "kibbles" my dog should eat? You may be familiar with the "kibble" count shown at the top of your app's home screen. This refers to the number of times your dog has cleared out the food dish. Keep in mind that the size of your dog's food can affect how many pieces come out at a time. If you have large kibble, only 1 or 2 pieces may be dispensed at a time, while if you have small kibble, several pieces may be dispensed at a time. So, the exact number of calories in each "kibble" varies across styles and brands of food. However, if you stick with the same food day-to-day and it has a relatively consistent shape, the total number of calories your dog gets from a given kibble limit should stay relatively the same from one day to the next. You may already know how many calories you'd like your dog to eat per day. If not, another approach is to see how much your dog naturally "wants". Leave the kibble limit set to unlimited, and observe how much she eats by checking the kibble count in your app at the end of the day. Then decide if you want to enforce a schedule. Please note: Using this feature, we can make sure your dog doesn't eat too much, but it’s a great idea to still check that your dog is eating enough! Dogs vary not only in size, but also in how much of their daily food they get from the Hub. Some eat one meal from the Hub, while some eat here and there throughout the day. Most dogs eat dry kibble, though some use the Hub to eat a hearty mix of treats, or even low-cal snacks such as chopped veggies. You should choose the amount that makes sense for your pup. Find out more about how to fit the Hub into your dog's feeding routine here. Max Daily Kibbles is available on iOS app versions 1.1.0 and up, and Android app versions 1.0.93 and up.